I can't think of an easier side salad than this. The light vinaigrette brings out the flavor of the fresh veggies. The white balsamic is less acidic than the darker balsamic which gives it less of a kick. This is a refreshing respite from the heavy dishes this season tends to bring. Bring about 4 cups of water to a boil in a large sauce pan. Trim the ends of the green beans off and halve any beans that are not about bite size (cutting at an angle makes them look nicer), and wash thoroughly. 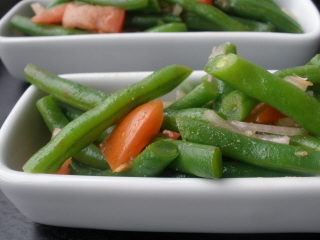 Once the water is boiling add the green beans for about 4 minutes, just long enough to take the edge off. Then put them immediately into an ice bath to stop the cooking process, and preserve the bright green color. Once the beans have been chilled add the drained beans to a medium size mixing bowl with the rest of the ingredients. Serve over micro greens if you wish or alone as a side dish.